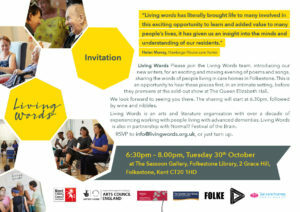 Living Words is an arts and literature organisation, created in 2007 by Susanna Howard. The main part of our work is care home residencies, taking place over 8 - 15 weeks. Our writers and artists work co-creatively and one-to-one with people experiencing a dementia and isolated and disempowered people. 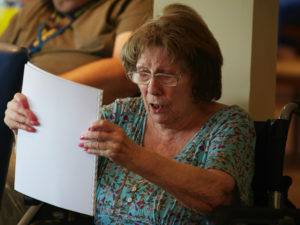 We enable individuals to feel heard and understood, even when communication seems lost. We run bespoke staff workshops and projects. We support free speech and expression. Inspired by this participatory work we create books, performances, films, podcasts and events. We collaborate with other artists and organisations. We are holding our First ever Fundraiser with Auction, Raffle, Words & Song. Tues 19th March 1830 - 2030. The Pullman, Folkestone. Take a look at these fantastic auction items for our first ever fundraiser. We are so grateful to all who have supported us. If you can come along, then do. If not, you can still bid – by getting in touch with charlotte@livingwords.org.uk to place your bid before 2pm on Tues 19th March. There will also be a raffle with fab prizes on the night. All budgets. A pair of tickets to world-leading alternative choir, London Contemporary Voices’ Women in Musicshow on 26 October in London’s iconic Union Chapel. Founded by artists Anil Sebastian and Didier Rochard for Imogen Heap’s ‘Love the Earth’ concert at Royal Albert Hall in 2010, LCV has worked with more than 100 artists, including Elbow, Keane (on last Friday’s Red Nose Day) and 18 Grammy winners / nominees. They also performed 3 Living Words songs that will be released as a single in the coming months. Last year’s Women in Musicshow won Union Chapel’s Best Show of the Year and featured stunning performances by Charlotte Church, Jessica Hoop, Maya Youssef and more! Is your decor dated? Allow Folkestone & Hythe’s premier decorating service, Harbour Décor, to provide a day’s non-commercial decorating. Dates and times to be confirmed with Harbour Décor – just contact jonathanharbourdecor@gmail.comand mention Living Words. A one-hour speech or presentation session with actor and performance trainer Oliver Senton. Oliver has appeared in most forms of live and recorded work, from a lead role in Mamma Mia!and the RSC to EastEndersand Call the Midwife. The session will be tailored to your needs, which may include pointers on voice projection, relaxation, how to maintain eye contact and much more. Paper artist and Folkestone resident Thurle Wright will make a small artwork out of a favourite poem or text. You will have seen Thurle’s intricate and philosophical work in many places across Folkestone, including Folkestone Book Festival. Originally from Zimbabwe, Thurle studied and taught modern languages and literature in Australia and the UK before specialising in visual art. Living Words’ patron Fiona Sampson has donated books from her collection, including the highly acclaimed 2018 best selling biography ‘Mary Shelley’. Primarily a poet, and formerly editor of Poetry Review, Fiona has been published in more that 30 languages, including 27 volumes of poetry. She has won many prizes, including the Newdigate prize, Cholmondey Award and Hawthornden Prize. If you don’t know Fiona’s poetry and biographic work – get bidding! A framed A4 print from the Seascapeseries by Andy Aitchison, a Folkestone-based photographer. Andy exhibited this print and others on the Harbour Arm as part of the 2018 SALT festival. As a big supporter of Living Words, he’s photographed – on a voluntary basis – many of the people whose stories Living Words tell. You won’t be defying gravity with this pair of top tickets for award-winning musical ‘WICKED’ in the Art Deco splendour of the Apollo Victoria Theatre in London. You’ll be sitting in the stalls. Tickets are for a performance on either – 7th, 8th, 14th, 15th, 21st or 22nd May at 7.30pm. A pack of 4 yoga classes with Samadhi Yoga founder, Renata Byrne, at her light, spacious Cherry Garden Avenue studio. Renata has more than two decades’ experience of the healing arts and offers a wide range of classes, private sessions, workshops and retreats at venues across Folkestone and East Kent. Class dates to be confirmed with Renata (samadhiyoga.renatabyrne@gmail.com),subject to availability. Got a speech to do at an important event? Let Susanna Howard take the strain. After an initial one- hour meeting to get all the info from you, Susanna will deliver one draft before final changes and a final draft. To a maximum of 10 minutes long. A special cinema pass to 2019’s Harbour Arm Screen season film programme from May to September, every Friday and Saturday night. The pass is for 4 people and worth £660! Plus, it includes a free blanket, so you can get cosy under the stars. A pair of tickets for a wine tasting and, weather permitting, a gentle guided walk and behind-the-scenes look at Terlingham Vineyard and how they make all their wine naturally and by hand, from grape to glass. The tasting will be held in the Vineyard’s wine cellar where you will be able to sample a selection of still and sparkling wines. This will be complemented with a delicious cheeseboard and crusty bread, finished off with a tea or coffee and a slice of our cake of the day. Established poet, wanna be writer or private dabbler? Whatever your writing level join this month-long online poetry-writing tutorial with BloodAxe-published poet, Living Words writer and Poetry School tutor Shazea Quraishi. This item includes an introductory chat, weekly prompts via email & poems to inspire writing, and feedback on up to 4 poems at the end of the month. Which dead monarch would you invite to dinner? What questions would you ask King Henry the Eighth, Queen Elizabeth I, Mary, Queen of Scots? What witty banter would you share with Queen Victoria or Queen Anne (of ‘The Favourite’)? Or, if monarch’s aren’t your bag – you could invite Winston Churchill or Oscar Wilde. Courtesy of Kate Howard, Creative Director of Past Pleasures Ltd, the UK’s largest professional provider of live, historical, costumed interpretation in the UK, you can select the famous historical figure of your choiceto attend your next function or dinner party. Remember Ralph McTell? The legendary singer-songwriter and acoustic guitar player who created the hit single, ‘Streets of London’, and many more? Ralph has kindly donated a book and audio version of his autobiography As Far as I Can Tell.Currently on a sell-out tour of Australia. On his return to the UK, Ralph will sign and make a recorded dedication to the winner of this item which will be included in the audio book – a complete one off! Flummoxed by Facebook? Twitter got you in a tangle? A place on Folkestone based Sleeping Giant Media’s ‘Social Animal’ one-day training course can help give you the hands-on skills necessary to take the strain out of your social media campaigns. You will learn how to optimise your posts for maximum effect, make creative & unique content, how to target sponsored ads, what tools are best to manage social media day to day and much more. At the end of the training you will have the skills and knowledge needed to run effective social media campaigns, and a deeper understanding of how social media can help achieve your business objectives. Dates available: Tue 30th April; Wed 18th June; Tue 20th August; Wed 10th December. Dazzlingly talented, prolific and award winning writer Danny Robbins, has written some of your favourite BBC Radio Four comedy dramas, including The Cold Swedish Winter and Rudy’s Rare Records, co-created with Lenny Henry. Rudy’s Rare Records became a hit theatre show, and most recently Danny wrote the top rated ‘End of The Pier’ play for theatre, starring Les Dennis and Blake Harrison (The Inbetweeners). Danny has written for a range of programmes, from sitcoms to panel shows and has written jokes for the likes of Joan Rivers, David Frost, Armando Iannucci, Dara O’Briain, Ronnie Barker, and even Basil Brush. He’s even once accidentally had a number 11 single in the charts! This makes this auction item so unique …: You can send Danny a copy of a comedy script for radio or stage that you have written. Danny will read the script, make notes and then discuss then with you either by Skype or in person in London during a 2 hour session. This item is to be spent by September 2019. 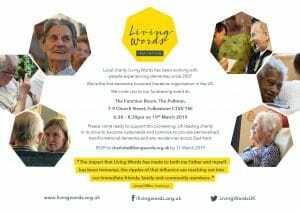 Founder and leader of Living Words, Susanna Howard, will provide 2 x 2-hour sessions with a person living with a dementia. The person will be provided with a copy of their words, edited with Susanna at a further third meeting. The person will need to live in East Kent.